Joannes BASTARACHE and his wife, 1 hoy 14 or older, 2 younger boys, 1 girl 12 or older; 2t arpents, 8 cattle, 20 sheep, 4 hogs, 3 guns. Olivier DAIGRE and his wife, 2 boys less than 14, 2 girls less than 12; 4 arpents, 15 cattle, 12 sheep, 8 hogs, 4 guns. PARISIEN and his wife, 3 boys less than 14, 1 girl less than 12; 3 arpents, 2 cattle, 12 sheep, 9 hogs, 1 gun. Rene FOREST and his wife, 4 boys less than 14, 2 girls less than 12; 8 arpents, 14 cattle, 24 sheep, 15 hogs, 1 gun. Emanuel HEBERT and his wife; 4 cattle, 6 sheep, 6 hogs, 1 gun. Jean HEBERT and his wife, 1 boy less than 14; 5 arpents, 5 cattle, 8 sheep, 7 hogs, 1 gun. Alexandre HEBERT; 5 arpents, 5 cattle, 8 sheep, 7 hogs, 1 gun. Pierre DUPUIS and his wife, 4 boys 14 or older, 2 younger boys, 1 girl 12 or over, 1 younger girl; 14 arpents, 20 cattle, 30 sheep, 22 hogs, 3 guns. The widow GIROUARD, 6 boys 14 or older, 2 girls less than 12, 10 arpents; 12 cattle, 18 sheep, 15 hogs, 2 guns. Jacques GIROUARD and his wife, 1 girl less than 12; 2 arpents, 4 cattle, 6 sheep, 12 hogs, 2 guns. Alexandre GIROUARD and his wife, 1 boy less than 14, 3 girl less than 12; 9 arpents, 20 cattle, 20 sheep, 13 hogs, 1 gun. Pierre COMMEAU and his wife, 1 boy less than 14, 2 girls 12 or older, 1 younger girl; 7 arpents, 16 cattle, 20 sheep, 28 hogs, 2 guns. Etienne MARTIN and his wife; 3 arpents, 3 cattle, 4 sheep, 8 hogs, 1 gun. Michel THIBEAUDEAU and his wife, 2 girls less than 12; 3 arpents, 9 cattle, 6 sheep. 5 hogs. 1 gun. Antoine THIBEAUDEAU and his wife, 2 girls less than 12; 1 arpent, 7 cattle, 15 sheep. 8 hogs, 1 gun. Pierre THIBEAUDEAU and his wife; 1 arpent. 7 cattle, 13 sheep, 8 hogs, 1 gun. LaRozette (Jacques LEGER) and his wife, 1 boy less than 14, 3 girls less than 12; 10 arpents, 11 cattle, 7 sheep, 6 hogs, 1 gun. Abraham COMMEAU and his wife, 1 boy less than 14, 2 girls less than 12; 6 cattle, 9 sheep, 8 hogs, 1 gun. Claude PITRE and his wife, 2 boys less than 14, 3 girls less than 12; 10 cattle, 9 sheep, 8 hogs, 2 guns. Pierre COMMEAU, the younger. and his wife, 2 boys 14 or older, 3 younger boys, 3 girls 12 or older, 1 younger girl; 6 arpents, 8 cattle, 12 sheep, 9 hogs, 2 guns. Pierre MARTIN and his wife, 2 boys 14 or older, 4 younger boys, 1 girl 12 or older, 2 younger girls; 4 arpents, 6 cattle, 13 sheep, 19 hogs, 2 guns. Alexandre COMMEAU and his wife, 2 girls less than 12; 1 1/2 arpents, 13 cattle, 22 sheep, 9 hogs, 1 gun. Sr. MICHEL and his wife, 2 boys 14 or older, 3 younger boys, 3 girls less than 12; 1 1/2 arpents, 7 cattle, 2 sheep, 1 hog. Estienne COMMEAU and his wife; 3 arpents, 5 cattle, 17 sheep, 10 hogs, 2 guns. Claude DOUCET and his wife, 2 boys less than 14, 9 girls 12 or older, 3 younger girls; 3 arpents, 4 cattle, 6 sheep, 3 hogs, 1 gun. Charles ROBICHEAU and his wife, 8 boys less than 14; 3 arpents, 14 cattle, 9 sheep, 11 hogs, 1 gun. Widow of NAQUIN, 3 boys less than 14; 9 cattle, 7 sheep, 11 hogs, 2 guns. Louis ALLAIN and his wife, 1 boy 14 or older, 1 girl 12 or older, 3 arpents; 25 cattle, 27 sheep, 14 hogs, 2 guns. Charles DOUCET and his wife, 4 boys 14 or older, 4 younger boys, 1 girl less than 12; 1 arpent, 4 cattle, 5 sheep, 8 hogs, 3 guns. Jacques DOUCET, 2 boys less than 14, 2 girls less than 12; 2 arpents, 2 cattle, 8 sheep, 3 hogs, 1 gun. Madeleine PLEMARAIS, 2 boys 14 or older, 1 younger boy, 1 girl 12 or older, 1 younger girl; 1 arpent 7 cattle, 1 sheep, 5 hogs, 3 guns. Claude LANDRYand his wife, 2 boys 14 or older, 1 younger boy, 1 girl 12 or older, 3 younger girls; 6 arpents, 21 cattle, 15 sheep, 20 hogs. 3 guns. Pierre LANDRY and his wife, 3 boys 14 or older, 2 younger boys, 1 girl 12 or older; 6 arpents, 19 cattle, 20 sheep, 13 hogs, 3 guns. Bernard DOUCET and his wife, 1 boy 14 or older, 1 girl 12 or older, 2 arpents; 4 cattle, 2 sheep, 13 hogs. Prudent ROUSSEAU and his wife, 4 boys under 14, 1 girl 12 or older, 3 younger girls; 8 arpents, 12 cattle, 18 sheep, 11 hogs, 2 guns. Francois ROBICHAUX and his wife, 1 boy less than 14, 1 girl less than 12; 3 arpents, 13 cattle, 17 sheep, 8 hogs, 1 gun. BABINAULT and his wife, 2 girls less than 12; 6 arpents, 17 cattle, 17 sheep, 16 hogs, 2 guns. Mr. ST SEINE and his wife, 1 boy 14 or older, 2 girls 12 or older, 1 younger girl; 3 arpents, 9 cattle, 22 sheep, 11 hogs, 1 gun. Madame de BELLE ISLE, widow, 1 boy 14 or older, 1 girl 12 or older. 1 younger girl; 8 arpents, 3 cattle. CLEMENSEAU and his wife; 2 cattle, 4 sheep. Mr. CACHOUET and his wife, 1 boy less than 14; 3 arpents, 5 cattle, 12 hogs, 2 guns. Jacques BONNEUR and his wife, 1 boy less than 14, 3 girls less than 12; 1 arpent. 2 cattle, 6 hogs. Maurice VIGNO and his wife, 3 boys less than 14; 2 arpents, 2 cattle. CHAMPAGNE and his wife, 1 boy less than 14, 1 girl less than 12; a arpent, 2 cattle, 2 sheep, 1 hog, 1 gun. FRANCOISET, his wife, 1 girl less than 12; 1 arpent, 2 cattle, 4 sheep, 3 hogs. Widow of ROBIN, 1 girl less than 12; 4 arpents, 2 cattle. Jean LABAT and his wife, 1 girl 12 or older; 8 arpents, 6 cattle, 12 sheep, 10 hogs. Old DENIS and his wife, 1 boy less than 14, 2 girls less than 12. Jean BELLENAUX and his wife. 2 boys 14 or older, 2 girls 12 or older, 1 younger girl; 6 arpents, 4 cattle, 6 sheep. Charles BELLINAUX and his wife. 1 hoy less than 14, 1 girl less than 12; 2 arpents, 3 cattle, 5 sheep. Antoine BELLINAUX and his wife, 1 boy less than 14, 1 girl less than 12; 2 arpents, 2 cattle. SAMSON and his wife, 2 boys less than 14, 2 girls less than 12; i arpent, 4 cattle, 5 hogs, 1 gun. LANGEVIN; 4 arpents, 4 cattle, 2 sheep, 6 hogs. 1 servant, 1 gun. Francois COST and his wife, 2 boys less than 14, 1 girl 12 or older, 1 younger girl; 1 1/4 arpents, 4 cattle, 10 sheep, 10 hogs, 1 gun. CORPORON and his wife, 3 boys 14 or older, 1 younger boy, 2 girls 12 or older, 1 younger girl. Andre SIMON and his wife, 2 boys 14 or older, 2 younger boys, 2 girls 12 or older, 2 younger girls; 2 arpents, 2 cattle. ST LOUIS and his wife, 1 boy 14 or older, 2 girls less than 12; 5 arpent 5 hogs, 1 gun. LAVERGNE and his wife. 1 boy less than 14, 1 girl 12 or older, 1 younger girl; 2 arpents, 2 cattle, 4 sheep, 9 hogs, 1 gun. Etienne PELLERIN and his wife, 3 boys 14 or older, 1 younger boy, 1 girl 12 or older, 7 younger girls; 3 arpents, 8 cattle, 19 sheep, 8 hogs, 2 guns. Abraham DUGAST and his wife, 1 hoy less than 14, 2 girls less than 12; 4 arpents, 12 cattle, 20 sheep, 12 hogs, 2 guns. Vincent TERRIOT and his wife, 3 arpents, 12 cattle, 27 sheep. 11 hogs, 1 gun. Francois BOUDROT and his wife, 3 boys less than 14, 2 girls less than 12; 14 arpents, 24 cattle, 35 sheep, 13 hogs, 1 gun. Claude DUGAST and his wife, 1 boy 14 or older, 2 younger boys, 2 girls 12 or older, 4 younger girls; 10 arpents, 30 cattle 35 sheep, 18 hogs, 3 guns. Alexandre ROBICHEAU and his wife, 1 boy less than 14, 2 girls 12 or older, 3 younger girls, 4 arpents, 18 cattle, 28 sheep, 12 hogs, 4 guns. LA LIBERTE and his wife, 1 boy 14 or older, 3 younger boys, 1 girl 12 or older, 2 younger girls; 4 cattle, 11 sheep, 5 hogs. Charles MELANSON and his wife, 1 boy less than 14; 4 arpents, 12 cattle, 14 sheep, 6 hogs, 2 guns. Ambroise MELANSON and his wife, 1 boy less than 14; 1 arpent, 5 cattle, 8 sheep, 4 hogs, 1 gun. Widow of MELANSON, 3 boys 14 or older, 1 girl 12 or older; 6 arpents, 18 cattle, 15 sheep, 12 hogs, 2 guns. Jean BELLINAUX, the younger, and his wife, 3 boys less than 14, 1 girl less than 12; 2 arpents, 18 cattle, 30 sheep, 9 hogs, 1 gun. Charles GUILLEBAUS and his wife, 2 boys less than 14, 1 girl less than 12; 10 arpents, 28 cattle, 40 sheep, 24 hogs, 1 gun. Bernard BOURG and his wife, 1 boy 14 or older, 3 girls less than 12; 8 arpents, 26 cattle, 30 sheep, 24 hogs, 2 guns. DESAULNIER and his wife, 1 boy 14 or older, 2 younger boys, 1 girl 12 or older, 1 younger girl; 8 arpents, 22 cattle, 32 sheep, 22 hogs, 7 guns. Abraham BOURG and his wife, 3 boys 14 or older, 3 younger boys, 2 girls 12 or older; 24 cattle. 28 sheep, 12 hogs, 1 gun. Rene GRANGER and his wife, 2 boys less than 12, 3 girls less than 12; 4 arpents, 20 cattle, 20 sheep, 13 hogs, 1 gun. Widow of GRANGER, 1 boy 14 or older, 1 girl 12 or older; 2 arpents, 7 cattle, 10 sheep, 12 hogs, 1 gun. Claude GRANGER and his wife, 1 boy less than 14, 1 girl less than 12; 2 arpents, 13 cattle, 15 sheep, 6 hogs, 1 gun. Rene DOUCET and his wife. 1 boy less than 14, 1 girl less than 12; 4 arpents, 19 cattle, 17 sheep, 8 hogs, 1 gun. Clement VINCENT and his wife, 1 boy less than 14, 1 girl less than 12; f arpent, 4 cattle, 4 sheep, 3 hogs, 1 gun. Le BonhommeNantois and his wife, 2 boys 14 or older, 2 younger boys, 2 girls 12 or older, 1 younger girl; 1/2 arpent, 2 cattle, 2 hog, 1 gun. LAMOUTAGNE and his wife, 2 boys 14 or older, 2 younger boys, 3 girls 12 or older, 1 younger girl; 6 arpents, 16 cattle, 28 sheep, 18 hogs, 2 guns. Androu LAMOUTAGNE, his wife, 2 girls less than 12; 7 cattle, 15 sheep, 8 hogs, 1 gun. Jean BRAULT and his wife, 1 boy 14 or older, 1 younger boy, 1 girl less than 12; 1 arpent, 9 cattle, 17 sheep, 15 hogs, 1 gun. Widow of VINCELOTTE, 1 hoy 14 or older, 5 girls less than 12; 6 arpents, 14 cattle, 17 sheep, 9 hogs. Bastien BRUN, 1 hoy less than 14, 2 girls less than 12; 3 cattle, 3 sheep, 2 hogs, 1 gun. Abraham BRUN, 1 boy less than 14, 2 girls less than 12; 3 cattle, 3 sheep, 2 hogs, 1 gun. Jean BRUN; 1 cow, 4 sheep, 1 gun. Claude BRUN; 1 cow 3 sheep, 1 gun. Marie BRUN; 1 cow, 2 sheep. Rene MARTIN and his wife, 1 boy less 14 or older. 5 younger boys, 1 girl less than 12; 16 arpents, 11 cattle, 17 sheep, 13 hogs, 2 guns. Pierre GODET, the younger, and his wife; 12 arpents, 22 cattle, 12 sheep, 22 hogs, 1 gun. Germain SAVOYE and his wife, 3 boys 14 or older, 3 younger boys, 2 girls 12 or older, 2 younger girls; 10 arpents. 22 cattle, 33 sheep, 14 hogs, 2 guns. Claude TERRIOT and his wife. Jean DUPUIS and his wife, 1 boy less than 14, 3 girls less than 12; 4 arpents, 15 cattle, 24 sheep, 12 hogs, 1 gun. Pierre LANOUE, Jr., and his wife, 1 boy less than 14, 1 girl less than 12; 4 arpents, 6 cattle, 10 sheep, 8 hogs, 1 gun. Guillaume BLANCHARD and his wife, 2 boys 14 or older. 2 younger boys. 2 girls 12 or older; 25 arpents, 32 cattle, 38 sheep, 14 hogs, 6 guns. Laurent DOUCET and his wife, 2 boys 14 or older, 3 younger boys, 1 girl 12 or older, 3 younger girls; 6 arpents. 12 cattle, 12 sheep, 10 hogs, 1 gun. Pierre ARSENAULT and Marie GUERIN 2 boys 14 or older, 4 younger boys; 8 arpents, 16 cattle, 16 sheep, 12 hogs. Pierre ARSENAULT and Anne BOUDROT, 2 boys less than 14, 1 girl less than 12; 4 arpents, 10 cattle, 13 sheep, 6 hogs. Abraham ARSENAULT and Jeanne GAUDET, 3 boys less than 14, 1 girl less than 12; 8 cattle, 6 sheep, 3 hogs. Charles BOURGEOIS and Marie BLANCHARD, 5 boys less than 14, 2 girls less than 12; 8 arpents, 15 cattle, 20 sheep, 12 hogs. Claude BOURGEOIS and Anne BLANCHARD, 1 boy less than 14, 1 girl less than 12; 4 arpents. Guillaume SIRE and Marguerite BOURG; 4 arpents, 10 cattle, 5 sheep, 2 hogs. Jean SIRE and Francois MELANSON, 2 boys less than 14, 1 girl less than 12; 4 arpents, 15 cattle, 15 sheep, 8 hogs. Pierre SIRE and Anne CORMIER, 2 girls less than 12; 8 arpents, 12 cattle, 8 sheep, 5 hogs. Michel ACHE and Anne CORMIER, 2 boys 14 or older, 4 younger boys, 1 girl 12 or older, 2 younger girls; 14 arpents, 24 cattle, 25 sheep, 20 hogs. Germain CORMIER and Marie LEBLANC, 1 boy less than 14; 4 arpents, 9 cattle, 10 sheep, 10 hogs. Jean POIRIER and Marie CORMIER, 1 boy less than 14; 4 arpents, 9 cattle, 10 sheep, 10 hogs. Francois CORMIER and Anne LEBLANC, 1 boy less than 14, 2 girls 12 or older, 4 younger girls; 8 arpents, 20 cattle, 20 sheep, 20 hogs. Michel POIRIER and Marie BOUDROT, 4 boys older than 14; 9 arpents, 20 cattle, 20 sheep, 12 hogs. Toussant DOUCET and Marie ROGER, 2 boys 14 or older, 4 younger boys, 1 girl 12 or older, 1 younger girl; 8 arpents, 21 cattle, 22 sheep, 15 hogs. Michel BOUDROT and Madeleine CORMIER, 1 boy 14 or older, 3 younger boys, 1 girl 12 or older, 2 younger girls; 15 arpents, 13 cattle, 18 sheep, 15 hogs. Rene BERNARD and Madeleine DOUCET, 1 boy 14 or older, 2 younger boys, i girl 12 or older, 2 younger girls; 8 arpents, 15 cattle, 12 sheep, 9 hogs. Louis DOUCET and Marguerite GIROUARD, 2 boys less than 14, 1 girl 12 or older; 15 arpents. 6 cattle, 5 sheep, 8 hogs. Alexis CORMIER and Marie LEBLANC, 1 boy less than 14, 3 girls less than 12; 10 arpents, 20 cattle, 16 sheep, 15 hogs. Michel POIRIER, Sr., Madeleine BOURGEOIS, 3 boys less than 14, 1 girl less than 12; 8 arpents, 16 cattle, 8 sheep, 10 hogs. Pierre POIRIER, Jr., Agnes CORMIER, 1 hay less than 14; 6 arpents, 12 cattle, 8 sheep, 8 hogs. Pierre HEBERT, Jeanne LANDRY, 2 boys less than 14; 16 arpents, 20 cattle, 30 sheep, 10 hogs. Joseph HEBERT, Anne BOUDROT; 12 arpents, 8 cattle, 15 sheep, 3 hogs. Jean FOREST and his wife, 4 boys less than 14; 4 arpents, 6 cattle, 10 sheep, 4 hogs. Pierre CORMIER, Catherine LEBLANC, 2 boys less than 14; 6 arpents, 9 cattle, 10 sheep, 8 hogs. Jean KENCY and Marie POIRIER; 8 arpents, 20 cattle, 20 sheep, 10 hogs. Pierre QUENEY and Terete MIRAUDE, 1 boy less than 14, 1 girl less than 12; 2 arpents, 15 cattle, 12 sheep, 6 hogs. Guillaume QUENEY, Jeanne PELLERIN, 2 girls less than 12; 4 arpents, 10 cattle, 2 sheep, 3 hogs. Michel QUENEY, Madeleine GODET, 1 girl less than 12; 2 arpents, 7 cattle, 12 sheep, 4 hogs. DAUPHINE and his wife, 1 hoy 14 or older, 4 younger boys, 2 girls 12 or older, 2 younger girls; 2 arpents, 10 cattle, 12 sheep, 10 hogs. Pierre CARRE and his wife, 2 girls 12 or older; 4 cattle, 2 sheep. Lejeune POIRIER and Marie GUERIN, 1 boy 14 or older, 4 younger boys. 3 girls less than 12; 4 arpents, 10 cattle, 12 sheep, 8 hogs. Jean POIRIER, Anne POIRIER 2 boys less than 14, 1 girl less than 12; 4 arpents, 12 cattle, 3 sheep, 4 hogs. Michel BOURG, Isabelle MELANSON. 1 boy 14 or older, 1 younger boy, 3 girls 12 or older. 1 younger girl; 8 arpents, 15 cattle, 13 sheep, 8 hogs. Martin RICHARD, Margte. BOURG, 1 boy 14 or older, 2 younger boys, 2 girls 12 or older, 8 younger girls; 20 arpents, 12 cattle, 10 sheep, 8 hogs. Pierre GODET, Anne GUERIN, 1 boy 14 or older; 8 arpents, 12 cattle, 5 hogs. Pierre GODET, Jr., Cecile MIGNAU, 1 boy under 14, 1 girl under 12; 6 arpents, 9 cattle, 8 sheep, 4 hogs. Abraham GODET, Agnes GIROUARD, 1 boy less than 14, 1 girl less than 12; 6 arpents, 6 cattle, 3 sheep, 7 hogs. Joseph MIRAUDE, Marie GODET, 2 boys less than 14; 6 arpents, 8 cattle, 5 sheep, 3 hogs. Jacques BLOU and his wife, 1 boy 14 or older, 4 girls 12 or older; 10 arpents, 15 cattle, 30 sheep, 12 hogs. Claude GODET, Marguerite BLOU, 1 boy under 14, 2 girls less than 12; 6 arpents, 12 cattle, 12 sheep, 8 hogs. Germain GIROUARD and his wife, 1 girl under 12; 6 arpents, 8 cattle, 4 sheep, 5 hogs. Laurent CHASTILLON and his wife, 2 boys 14 or older, 4 younger boys. 3 girls 12 or older, 2 younger girls. Gabriel CHIASSON and his wife, 4 boys 14 or older, 2 younger boys, 3 girls 12 or older. Charles LAGERIE and his wife, 1 boy 14 or older. 3 younger boys; 3 cattle. Le Sr. BAPTISTE and his wife, 2 boys 14 or older, 2 younger boys, 1 girl 12 or over; 5 arpents, 8 cattle, 4 sheep, 4 hogs. TOTAL: 45 married men, 27 boys 14 or over, 78 young boys, 27 girls 12 or older, 49 young girls, 286 arpents of farmed land, 510 cattle, 500 sheep, 328 hogs. Martin BLANCHARD and Marguerite GUILLEBAUT, 2 boys 14 or older, 1 younger boy, 1 girl 12 or older; 8 arpents, 14 cattle, 9 sheep, 9 hogs. Martin BOURG and Marie PETER, 2 boys 14 or older, 3 younger boys, 1 girl 12 or older; 8 arpents, 18 cattle, 12 sheep, 15 hogs. Pierre THERIOT and Marie BOURG. 1 boy less than 14, 4 girls less than 12; 8 arpents, 15 cattle, 8 sheep, 15 hogs. Vincent LOUGUE-ESPEE and Madaleine RAMBAULT, 1 hoy 14 or older, 1 girl 12 or older, 4 younger girls; 4 arpents, 1 cow. Jean HEBERT and Marie LANDRY, 2 boys less than 14, 1 girl less than 12; 6 arpents, 12 cattle, 14 sheep, 9 hogs. Girault GUERIN and Isabelle AUCOIN, 3 girls less than 12; 6 arpents, 10 cattle, 6 sheep, 10 hogs. Germain THERRIOT and Marie MORIN, 2 boys 14 or older, 3 younger boys, 1 girl 12 or older, 2 younger girls; 6 arpents, 12 cattle, 10 sheep, 8 hogs. Joseph DUGAST, Clair BOURG, 1 boy less than 14, 2 girls less than 12; 6 arpents. 15 cattle, 6 sheep, 8 hogs. Claude DUGAST, Jeanne BOURG, 2 boys less than 14, 1 girl less than 12; 6 arpents, 10 cattle, 7 sheep, 6 hogs. Michel AUCOIN, Jeanne BOURG, 2 boys 14 or older; 5 arpents, 15 cattle, 12 sheep, 6 hogs. Abraham BOURG and Anne DUGAST, 1 girl 12 or older; 6 arpents, 7 cattle, 6 sheep, 8 hogs. Jean BOURG; 6 arpents, 4 cattle. Francois GAUTROT; 6 arpents, 8 cattle. Pierre BOURG, Marguerite BLANCHARD; 6 arpents, 8 cattle, 10 sheep, 6 hogs. Martin HENRY, Marie HEBERT, 1 boy 14 or older. 1 girl 12 or older; 4 arpents, 75 cattle, 4 sheep, 4 hogs. Alexis AUCOIN, Marie BOURG; 5 arpents, 9 cattle, la sheep, 5 hogs. Jean BENOIT, Anne BRAULT, 1 hoy 14 or older, 1 girl 12 or older; 5 arpents, 7 cattle, 10 sheep, 5 hogs. TOTAL: 17 married men, 11 boys 14 or older, 13 young boys, 7 girls 12 or older, 19 young girls, 101 arpents of farmed land, 170 cattle, 121 sheep, 114 hogs. Jean LANDRY, his wife, 3 boys 14 or older, 2 younger boys, 1 girl 12 or older; 12 arpents, 16 cattle, 12 sheep, 26 hogs. Pierre MELANSON, his wife. 1 boy 14 or older. Jean MELANSON, his wife. 1 girl 12 or older, 1 younger girl; 5 arpents, 6 cattle, 2 sheep. 6 hogs. Philipe MELANSON, his wife, 1 boy less than 14, 3 girls 12 or older, 5 younger girls; 5 arpents. 8 cattle, 3 sheep, 8 hogs. Pierre MELANSON, his wife, 6 girls less than 12; 5 arpents, 4 cattle, 5 sheep, 6 hogs. Alain BUGUEAUT his wife, 5 boys less than 14, 1 girl 12 or older. Pierre THERRIOT, his wife; 14 arpents, 20 cattle, 14 sheep, 16 hogs. Rene BLANCHARD, his wife, 1 girl 12 or older, 1 younger girl; 1 arpent, 7 cattle, 6 sheep, 6 hogs. Pierre BRASSAUD, his wife, 1 girl 12 or older, 1 younger girl; 3 arpents, 2 cattle, 4 sheep, 5 hogs. Germain THERRIOT, his wife, 7 boy 14 or older, 5 younger boys, 2 girls less than 12; 6 arpents, 12 cattle, 10 sheep, 15 hogs. Jean THERRIOT, his wife 1 boy 14 or alder, 1 girl 12 or older, 4 younger girls; 5 arpents, 15 cattle, 13 sheep, 15 hogs. Pierre FOREST, his wife, 1 boy 14 or older, 1 girl 12 or older, 3 younger girls; 6 arpents, 18 cattle, 15 sheep, 7 hogs. Michel VINCENT, his wife, 2 girls 12 or older, 4 younger girls; 1 arpent, 10 cattle, 8 sheep, 4 hogs. Antoine BRAULT, his wife, 1 boys 14 or older, 2 younger boys, 2 girls 12 or older, 3 younger girls; 4 arpents, 16 cattle, 15 sheep, 12 hogs. Jean BABIN and wife, 1 boy less than 14; 3 arpents, 10 cattle, 12 sheep, 7 hogs. Francois MICHEL, his wife, 2 boys less than 14, 2 girls less than 12; 15 cattle, 12 sheep, 9 hogs. Alexandre BOURG. his wife, 1 boy 14 or older, 1 girl 12 or older. 4 younger girls; 8 arpents, 18 cattle, 15 sheep, 10 hogs. Vincent BABIN, his wife, 1 hoy 14 or older, 2 younger boys, 2 girls less than 12; 4 arpents, 12 cattle. 10 sheep, 8 hogs. Charles BOUDROT and wife; 1 1/2 arpents, 5 cattle, 3 sheep, 4 hogs. Etienne RIVETTE; 1 1/2 arpents, 2 cattle. Widow of RIVET, 3 boys less than 14, 1 girl 12 or older; 2 arpents, 2 cattle, 1 sheep. Phillipe PINET, his wife, 2 boys 14 or older, 2 younger boys, 3 girls 12 or older; 12 arpents, 9 cattle. 10 sheep, 6 hogs. Martin DUPUIS, his wife, 3 boys 14 or older, 2 younger boys, 1 girl 12 or older, 2 younger girls; 6 arpents, 10 cattle, 10 sheep, 10 hogs. Pierre RICHARD, his wife, 2 boys 14 or older, 2 younger boys, 1 girl 12 or older; 6 arpents, 15 cattle, 11 sheep, 16 hogs. Jacques LEBLANC, his wife, 2 boys less than 14, 2 girls less than 12; 7 arpents, 10 cattle, 8 sheep, 10 hogs. Claude GAUTROT, his wife, 1 boy less than 14, 3 girls 12 or older, 2 younger girls; 5 arpents, 16 cattle, 13 sheep, 12 hogs. Rene LEBLANC, his wife, 3 boys 14 or older, 1 younger boy, 1 girl less than 12; 6 arpents, 4 cattle, 12 sheep, 12 hogs. Charles GAUTROT, his wife, 3 boys 14 or older, 2 younger boys, 4 girls less than 12; 4 arpents, 12 cattle, 12 sheep, 12 hogs. Abraham DUGAST, his wife, 1 boy 14 or older, 3 girls, 12 or older; 1 arpent, 8 cattle, 16 sheep, 10 hogs. Andre LEBLANC, his wife, 2 boys 14 or older, 3 younger boys, 2 girls 12 or older; 2 arpents, 9 cattle, 4 sheep, 1 hog. Mathieu BRAUSSEUR, his wife, 1 boy less than 14, 1 girl less than 12. Jean DOUCET, his wife, 2 boys 14 or older, 2 girls 12 or older; 4 arpents, 6 cattle, 14 sheep, 15 hogs. Estienne HEBERT, his wife, 2 boys 14 or older. 2 younger boys, 2 girls 12 or older, 2 younger girls; 5 arpents, 30 cattle, 30 sheep, 20 hogs. Germain LANDRY, his wife, 4 boys less than 14, 2 girls less than 12; 4 arpents, 14 cattle, 14 sheep, 15 hogs. Pierre LANDRY, his wife, 1 boy less than 12; 4 arpents, 10 cattle, 11 sheep, 7 hogs. Marie BERNARD, widow, 1 boy 14 or older. Abraham LANDRY, his wife, 1 girl less than 12; 4 arpents, 12 cattle, 11 sheep, 12 hogs. Pierre VINCENT, his wife, 1 boy 14 or older, 2 younger boys, 1 girl less than 12; 3 arpents, 8 cattle, 4 sheep, 6 hogs. Michel HEBERT, his wife, 1 boy 14 or older, 2 younger boys. 2 girls less than 12; 4 arpents, 12 cattle, 10 sheep, 7 hogs. Pierre BRAULT, his wife, 3 boys less than 14, 1 girl 12 or older, 3 younger girls; 2 arpents, 10 cattle, 6 sheep, 30 hogs. Jean BOURG, his wife, 1 boy less than 14; 3 arpents, 2 cattle, 3 sheep. Pierre THIBEAUDEAU his wife, 2 boys 14 or older, 3 younger boys, 1 girl 12 or older, 1 younger girl; 5 arpents, 12 cattle, 8 sheep, 10 hogs. Guillaume TRAHAN, his wife, 4 boys less than 14, 1 girl less than 12; 3 arpents, 14 cattle, 12 sheep, 5 hogs. Alexandre TRAHAN, his wife, 2 boys 14 or older, 4 younger boys, 3 girls less than 12; 4 arpents, 12 cattle, 15 sheep, 8 hogs. Jean COMMEAU, his wife, 2 boys less than 14, 1 girl 12 or older, 4 younger girls; 2 arpents, 10 cattle, 10 sheep, 8 hogs. Martin BENOIST, his wife, 1 boy 14 or older, 3 younger boys, 1 girl 12 or older; 4 arpents, 1 hog. Pierre BENOIST, his wife, 1 boy less than 14, 2 girls 12 or older; 8 arpents, 3 cattle, 4 sheep. Clement BENOIST, his wife, 1 hoy less than 14, 1 girl 12 or older; 2 arpents, 4 cattle, 2 sheep, 3 hogs. Estienne COMMEAU, his wife, 1 boy less than 14; 2 arpents, 7 cattle, 11 sheep, 3 hogs. Michel FOREST, 2 boys 14 or older, 3 younger boys, 1 girl 12 or older, 1 younger girl; 4 arpents. 9 cattle, 8 sheep. 2 hogs. Charles DOURIRON, his wife. 1 boy 14 or older, 3 girls less than 12; 2 arpents, 6 cattle. 10 sheep, 10 hogs. Jean MARTIN, his wife, 1 girl 12 or older, 5 younger girls; 1 sheep, 3 hogs. Pierre BENOIST, his wife, 1 boy less than 14, 1 girl less than 12; 1 arpent, 4 cattle, 4 sheep, 4 hogs. Francois BRAULT, his wife, 2 girls less than 12; 4 arpents. 8 cattle, 3 sheep, 7 hogs. Pierre COMMEAU, his wife, 1 girl less than 12; 3 cattle, 2 sheep, 5 hogs. Pierre GIROUARD, his wife, 2 boys less than 14, 2 girls less than 12; 4 arpents, 8 cattle, 5 sheep. 6 hogs. Bernard DAIGRE, his wife, 2 boys 14 or older, 7 younger boys, 2 girls less than 12; 3 arpents, 12 cattle, 7 sheep, 9 hogs. Jean HEBERT, his wife, 2 boys 14 or older, 1 younger boy, 4 girls less than 12; 4 arpents, 12 cattle, 8 sheep, 4 hogs. Jean DOUAIRON, his wife, 1 boy 14 or older, 2 girls 12 or older, 2 younger girls; 3 cattle. Nicolas BARILLOT, his wife 3 boys less than 14, 1 girl 12 or older. 1 younger girl; 3 arpents, 4 cattle, 2 sheep, 6 hogs. Widow of Jean GODET, 2 boys less than 14, 1 girl less than 12; 1 cow. Francois LEBLANC, his wife, 2 boys less than 14; 8 arpents, 18 cattle, 13 sheep, 1 hog. Jean LEBLANC, his wife, 2 boys less than 14, 2 girls less than 12; 2 arpents, 6 cattle, 6 sheep, 6 hogs. 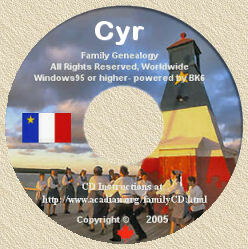 Claude LANDRY, his wife, 3 boys 14 or older. 1 younger boy, 1 girl 12 or older. 4 younger girls; 6 arpents, 18 cattle, 20 sheep, 6 hogs. W widow of HEBERT, 1 boy 14 or older, 3 younger boys, 1 girl 12 or older, 2 younger girls; 6 arpents, 10 cattle, 25 sheep, 13 hogs. Jacques LEBLANC, his wife, 3 boys 14 or older. 2 younger boys, 1 girl 12 or older, 1 younger girl; 4 arpents, 15 cattle, 25 sheep, 12 hogs. Jean THIBEAUDEAU, his wife, 1 boy less than 14, 1 girl less than 12; 3 arpents, 13 cattle, 15 sheep, 12 hogs. Claude BOUDROT, his wife, 2 boys 14 boy or older, 2 younger boys, 7 girls 12 or older. 8 younger girls; 20 arpents, 30 cattle, 15 sheep, 15 hogs. Pierre DOUAIRON, his wife, 1 boy less than 14. Jean CORPORON. his wife, 1 boy less than 14. Antoine BLANC, Jr., his wife, 1 boy less than 14, 1 girl less than 12; 5 arpents, 5 cattle, 8 sheep, 8 hogs. Antoine LANDRY, his wife, 7 boy less than 14; 1 arpent, 3 cattle, 8 sheep, 8 hogs. Martin AUCOIN, Jr., his wife, 1 boy less than 14, 3 girls less than 12; 8 cattle, 13 sheep, 8 hogs. Claude THERRIOT, his wife, 1 hoy less than 14, 1 girl less than 12; 2 arpents, 6 cattle, 6 sheep, 12 hogs. Martin AUCOIN, his wife, 2 boys 14 or older, 4 younger boys, 2 girls 12 or older, 2 younger girls; 7 arpents, 15 cattle, 20 sheep, 12 hogs. Rene LANDRY, his wife, 3 boys less than 14, 1 girl 12 or older, 2 younger girls; 5 arpents, 22 cattle, 15 sheep, 7 hogs. Jean TRAHAN, his wife, 2 boys 14 or older, 2 younger boys, 1 girl 12 or older, 1 younger girl; 2 arpents, 13 cattle, 10 sheep, 4 hogs. Widow of LAROCHE, 3 boys 14 or older, 2 younger boys, 1 girl 12 or older, 2 younger girls; 3 arpents, 2 cattle, 10 sheep, 10 hogs. Charles BOUDROT, his wife, 2 boys 14 or older, 3 younger boys, 1 girl 12 or older, 1 younger girl; 2 arpents, 4 cattle, 7 sheep, 6 hogs. Louis SAULNIER, his wife, 3 boys 14 or older, 2 younger boys, 2 girls 12 or older, 3 younger girls; 5 cattle, 8 sheep, 4 hogs. Antoine LEBLANC, his wife, 2 boys 14 or older, 4 younger boys, 3 girls less than 12; 8 arpents, 12 cattle, 10 sheep, 14 hogs. Robert HENRY, his wife, 2 boys 14 or older. 2 younger boys, 3 girls less than 12; 2 arpents, 2 cattle, 4 sheep, 2 hogs. Widow ?? ?, 1 boy 14 or older, 1 younger boy, 1 girl 12 or older, 2 younger girls; 2 sheep, 3 hogs. Pierre GRANGER, his wife, 2 boys less than 14, 3 girls less than 12; 2 arpents, 5 cattle, 2 sheep, 10 hogs. Jacques GRANGER, his wife, 1 boy less than 14, 2 girls less than 12; 2 arpents, 8 cattle, 8 sheep, 9 hogs. Jacques HEBERT and his wife; 3 arpents, 6 cattle, 5 sheep, 6 hogs. Guillaume HEBERT; 3 arpents, 6 cattle, 6 sheep, 6 hogs. TOTAL: 88 married men, 71 bays 14 or older, 135 young boys, 64 girls 12 or older, 130 young girls, 291 arpents of farmed land, 766 cattle, 718 sheep, 639 hogs.